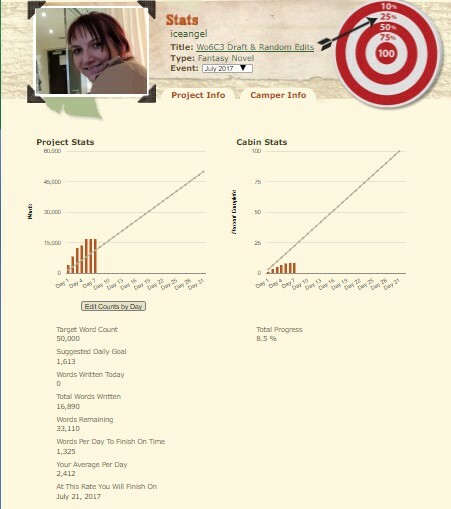 Camp NaNoWriMo Progress Update: Nooooooooo! Still ahead of schedule… Just. To be honest, though, I thought I’d skip the difficult second week. Not because week one was epic (and it was), but because I’m in the final sixth of my book. These are the final chapters leading up to the climactic point and the last ones to finish the book off. But what I didn’t count on was that, when I threw a huge curve ball at my characters, they would retaliate with a massive one in return. You’d think, after having about six iterations of this same event in my draft novels without much of a dent, nothing would change when I let the same thing happen now. Because I hadn’t taken into account one major thing: Every time before, the thing happened early in the story. This time, it happened near the end. And because of everything that had happened before the event, the characters were now armed with a set of information that pointed to something I hadn’t even looked at. I’ve been struggling to write even 1000 words a day since Tuesday. The moment I get to scenes around this event, my unwilling fingers slow down to a drag and I want to burst into tears. But hey! Drama’s good. So I can’t complain too much. I just have to get over this. And hopefully my poor readers will cry just as hard when they hit this scene. I’m not going to say what it was, but… I think you’ll know when you see it. How are you doing? Have you ever had a character spring a whole new world of pain on you? How did you recover? I’ve had a bit of a whirlwind week since last Friday, which is why I’ve been so quiet. The truth is that I had a few minutes in which to whip up a post for the blog, but I felt bad to update when I know for a fact that I won’t have the time to visit bloggers. That said, I’ve made some epic progress this week. It started on Saturday. See, I’ve been working on some huge editing projects, and the big one was waiting for me this week. 120 thousand words is nothing to sneeze at and the client was waiting. So I was worried that I wouldn’t be able to get everything done and still write. The solution, spend my off time on the weekend to write enough to make up for par on Friday. That way, anything I wrote in the week would basically be a nice extra instead of a cause for alarm because I wasn’t making the daily word count goal. I didn’t quite make it, but I did write 8,000 words in two days. And then I wrote 4,000 more on Monday. As of yesterday, I was at just under 17k words in total. Which is… a bit insane, really. Especially when you think I was writing that much while editing someone else’s book. But then yesterday went wrong. I’m not going to go into it in detail, but my first writing block in the morning got knocked out without me being able to write. So I decided to sit down and push to finish the editing project. The thought is that if I do that, I basically have today and the weekend to write. But I ignored the niggling head-achy feeling forming behind my eyeballs. The result: I had to go sleep at 8 p.m. (which knocked out my second writing session for the day). With the mother of a headache. People who’ve had one of these will get it: burning eyes, burning neck and shoulders, nausea and please God just let me die in my sleep because it’s night and I’m on a farm but the moonlight is too bright and it hurts. Luckily for me, the good Lord knows when I’m not completely serious. Unluckily for me, I’m doing my best to type this without looking at my screen too much because after almost fourteen hours of sleep and three pain meds, I’m still feeling like it’s there. I’m a bit angry at myself. I’ve been on this ride before. I know the signs. There were things I should have done. For one thing, when I noticed the head-achy feeling starting to throb in my temples, I should have taken something. For another, I should have enlarged the text I was editing so it wouldn’t stress my eyes so much. I should have dimmed my screen while I was at it. When I felt my shoulders, neck and jaw clenching, I should bloody well have stopped. But I was just twenty pages out from being finished, so what harm would it do? Some days, I’m a bloody fool. How are you doing? Are you doing Camp NaNo? How’s it going?